To succeed in a sales position of any type, you must be a proficient listener. This comes more easily to some reps than others. To help salespeople continue to develop this ability, sales leaders should run listening exercises during staff meetings, recommend books and articles on the subject, monitor sales calls and offer targeted coaching. Becoming a better listener takes practice, practice, practice. For more tips on this all important skill, I turned to Laurie Schloff, a career communication coach and author of "Smart Speaking," who works for the Speech Improvement Company in Brookline, Massachusetts. Laurie's clients include Fidelity Investments, The TJX Companies, and Vertex Pharmaceuticals. Laurie generously shared her advice about listening. Laurie often gets asks how much reps should talk on a sales call? She says, "Every customer is different. Some prospects talk your head off, while others speak less. During the first meeting it should be no more than 50/50 (rep/customer), ideally 25/75. In subsequent meetings the ratio may shift, but always be aware of attending to your customers needs and reactions." Before I tell you about our company, I'd like to get to know you and your business better. Do you mind if I ask a few questions? Tell me about a week in the life of a [prospect's position at company]. What's going well for you regarding [topic]? It sounds like you're doing well. What would be even more helpful or effective to get the results you'd like to see? How do you feel I can add to your positive results? Asking check-in questions ("Am I on track?" "Do I understand you correctly?") Laurie advises using these questions sparingly. Ask them too often and it becomes annoying. Laurie suggests conducting a self-evaluation after each call, rating yourself on your question asking and persuasive listening skills. "For anyone who talks a lot for a living," Laurie says, "picture the letters WAIT on their forehead. This stands for Why Am I Talking?" She feels (and I concur) that high-performing salespeople have a fundamental belief that being a very effective listener is key to succeeding in the profession. As sales leaders, we coach reps to ask strong, impactful questions of customers and prospects. While that's a critically important skill, we often forget to devote equal time to developing the other side of the equation - listening to the answer. We've all managed the rep who asks a question, then pays little attention to the customer's response. They're usually thinking about what they will say right after the customer finishes speaking. Once the customer pauses for a moment or takes a breath, this rep starts talking again immediately. Top producing reps listen very effectively. They never interrupt, encouraging the customer to say more by asking follow-up questions. These salespeople know that what the customer says after they pause contains some of the most important information of the sales call. Most people consider themselves good listeners. Few of us actually are. 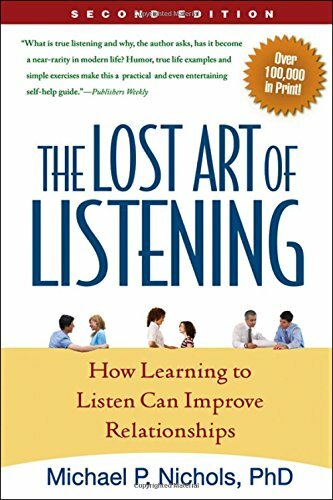 For the summer reading list, I am recommending books on the art of listening. 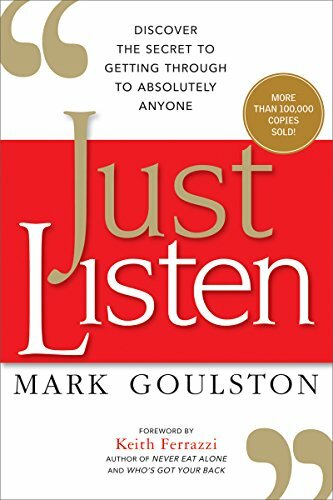 A Clinical Intervention psychiatrist and UCLA professor of psychiatry, Dr. Goulston wrote this concise but highly informative book on the art of hearing other people. Over 100,000 copies have sold. Using examples from all walks of life, he provides ideas, techniques, sample questions and tools to make improvements in this all important area. Considered by many to be an essential read, this book receives consistently strong customer reviews on Goodreads and Amazon.com. Dr. Nichols, a Professor of Psychology at the College of William and Mary, helps us understand why we do some of the things we do (like interrupting people) and offers practical techniques to help us improve. He tells us we have to learn to let others speak. From the Harvard Negotiation Project, the group that authored Getting to Yes, this book has been on the New York Times Business Bestseller list. It serves as a practical, easy to follow guide for approaching tough discussions - instead of avoiding them - as many of us tend to do. I used this book with a client I coached and still practice some of the tactics we learned. Great leaders have strong listening skills, often speaking less frequently than anyone in the room. Nickerson puts forth that we'd all benefit from talking less and listening more. A JD, an MBA and an avid martial artist, Mr. Nickerson (President and Principal of PDS, Inc. a $400 million dollar engineering and IT staffing firm) shares what he's learned in business and in life. 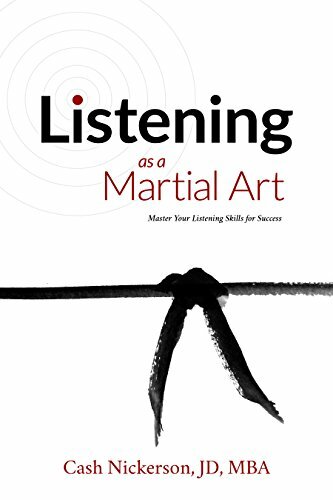 You don't have to be a martial arts expert to appreciate what he has to say about listening. Sales is a challenging and competitive profession. Successful salespeople look for ways to set themselves apart from all the others. Encourage reps to distinguish themselves by being that rare, sincere listener. Listening demonstrates poise, gains trust and most importantly enables your salesperson to do their best to meet customer's needs. A client writes "When a prospect expresses interest in my company's product, we encourage them to sign up for our hour-long demo. Many balk at this, saying they don't have that kind of time. They ask if we have a shorter one. We don't. It's a frustrating situation for management and the salespeople. "We spent a lot of money and resources developing this demo. With potential customers well informed about our product when they contact us, I assumed they would be ready for this level of detail. What are we doing wrong?" Long demos, multi-page white papers, and emails with six different attachments. Buyers I know complain about this frequently. It's a problem. We all know the buying cycle has changed. Customers spend time educating themselves about a product or service, then contact the vendor. They have moved through part of the sales cycle before speaking with a salesperson. Except that part of the way differs from all of the way. Companies misunderstand this and inundate prospects with information. Tell me about your needs in this area. How do you handle this issue currently? Have you looked at our website / blog / LinkedIn page? What was of particular interest to you? Companies must create and make available to reps: webinars, presentations, product demos and marketing information of varying lengths and types appropriate to the customer's level of interest. As reps get better at asking questions and listening to the answers, they'll start to more clearly understand each situation and which one works best in that particular situation. Instead of offering all prospects an hour long demo, create a 10 - 15 minute presentation. Almost everyone has that kind of time. Customers communicating enthusiasm for the product will likely either agree to see the presentation right then and there - or schedule a time to take a look. Reps offering a short demo make no hard and fast assumptions about a prospect's interest level, respect their schedule, and provide appropriate "next level" information. This paves the way for another sales interaction. If a customer conveys a genuine interest in the product, backs this up with facts or figures from their online search, has a recommendation from a colleague or assures the rep your product is far and away their number one choice, you could potentially interest them in an hour-long demo. But if they balk at this time commitment, you could irritate or scare them off. Where do you go from there? Few prospects watch an hour-long demo spontaneously or by themselves. Most want to schedule it at a time that works for them and ask several other employees to participate in the process (a good sign). It should be reserved only for those prospects at the appropriate place in the sales cycle and worth everyone's time investment - yours and theirs. A reader writes, "One of my better sales reps often sends out emails loaded with misspelled words, grammatical errors and too many attachments. Whenever I see one he's sent out I'm embarrassed. Short of short of editing every email, how can I fix this problem?" Sloppy emails reflect badly on your company. Salespeople need to view using any means of communication that identifies your organization (from electronic to old fashioned letterhead) as a privilege not a right. They must send out business appropriate correspondence always. You know this employee. Presumably you've seen other written work of his. Has too much texting or tweeting caused him to become careless or does he have weak writing skills in general? Select one or two of his particularly egregious emails and read them together. Hear his thoughts on them. If he makes excuses, remind him these two don't represent the only badly written emails of his that you've come across. Ask him a question like, "If a salesperson was asking you to spend $63,000 of your company's money, what would you think if you received an email like this from them?" Get a dialogue going. Discuss the importance of accurate business correspondence. Underscore the need to be much more careful when writing and sending emails - and that you'll be monitoring the situation. If his shoddy emails represent generally poor writing skills, say something like, "I've been noticing a problem with any written work that's required of you." See what he says. Be patient. The conversation might be awkward. Discuss his progress periodically and keep an eye on any correspondence with customers. Savvy sales organizations create templates to fit all different kinds of letter writing occasions like introductory and follow-up emails. Talk to those at your company with strong writing skills. Put some of their better correspondence into files for all to use. Insist, at least for a period of time, that new sales reps as well as those reps with problematic writing issues stick verbatim to the templates as written. Eager to get prospects excited about their product or service, sales representatives sometimes attach multiple files neither asked for by the customer nor necessary to move the sale forward. Ironically, this overzealousness may annoy or push the prospect away. For introductory emails especially, if reps attach a file at all, it should be very general, with no mention of pricing. It's too premature in the sales process for that discussion. Going forward, any attachments should be requested by the customer or mutually agreed to by the rep and the customer. Email and other electronic means of communication have increased the speed and efficiency of correspondence between sales reps and their customers to a degree not thought possible, even 20 years ago. With this advantage comes a responsibility for sales managers and salespeople alike to safeguard against mistakes, abuse and over use of technology.